Army Sergeant First Class Gary Pearson joined the military in 1999 because he wanted to serve the country he loved, and because his family has a long, proud history of military service. He was medically discharged in 2016. Throughout his 17 years of military service and three deployments that equaled nearly three years of combat time, Sergeant First Class Pearson suffered severe psychological wounds. During his second tour in Iraq his PTSD became so severe that he had to take a hiatus from the Army. 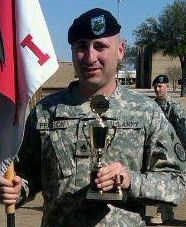 For his service to his country, Sergeant First Class Pearson has been awarded the Bronze Star, Meritorious Service Medal., Army Commendation Medal (4x), Army Achievement Medal (4x), Army Good Conduct Medal (4x), Expeditionary Medal, Global War on Terrorism Service Medal, Iraq Campaign Medal w/ Campaign Stars, Meritorious Unit Award, Valorous Unit Award and the Combat Action Badge. Sergeant First Class Pearson, his wife Teresa and their two children received a mortgage-free home in Avon, Indiana in May of 2017.